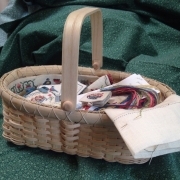 Barbara Jackson is well known throughout the needlework world for her love of traditional early English and American design. She is a graduate of the National Academy of Needlearts teacher certification program, and holds a certificate “with distinction” from England’s Royal School of Needlework. Barbara has taught for many organizations over the years, including the ANG National Seminar, EGA National Seminar, and Callaway School of Needlearts. She markets her own original designs under the Tristan Brooks logo. 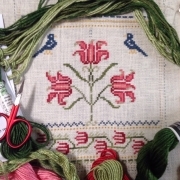 Her work has been featured in Needle pointers, Needlepoint Now, Inspirations magazine (including cover of 2010 issue #67), the EGA magazine and Sampler and Antique Needlework Quarterly.